Upon swearing in as a Peace Corps Volunteer, you are not only embarking on an incredible life-changing adventure, but are also becoming a lifetime member of the broader tight-knit Peace Corps community! As PCV Brian knows from experience, the Peace Corps network can be a great resource for Volunteers to help find creative ways to support their communities during their service. Read on to find out how PCV Brian partnered with RPCV Nancy, co-founder of non-profit Bricks to Bread! 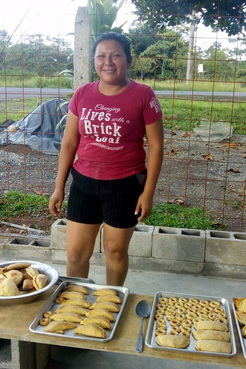 In July 2017, Peace Corps Volunteer Brian was introduced to Nancy Fitzimons Alvarado, a 1989 returned Peace Corps Volunteer and the co-founder of the non-profit organization Bricks to Bread. Brian partnered with the organization with the hopes of bringing a great (and delicious) opportunity to his community. Their mission is to support Costa Rican women entrepreneurs develop a sustainable source of income for themselves and their families. 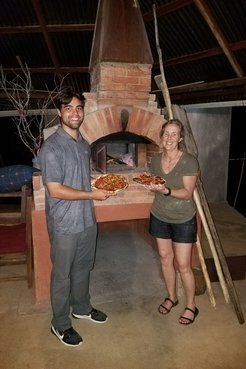 They work with local partners such as Peace Corps, bring volunteers from abroad to help build a brick oven and work alongside the women and their communities. The outdoor brick ovens are used to make and sell pizzas and fresh baked goods to each community. After almost a year of back and forth communication and planning, Brian and Nancy found a more than deserving person to be the org’s second-ever oven recipient, Daysi. Group of Bricks to Bread volunteers from the USA who helped construct the oven in Brian's site. 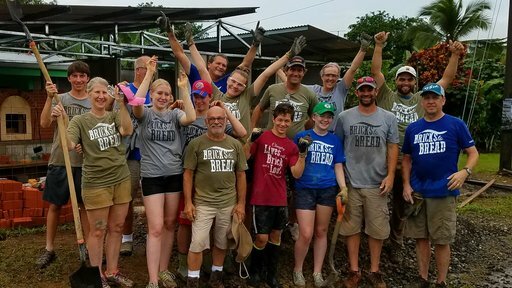 In July 2018, a crew of wonderful volunteers from the United States spent two weeks of their summer helping build the oven. While the work was rewarding, what the group cherished the most was making relationships here in Costa Rica that will last a lifetime. The volunteers were also able to understand better the day to day life of a Peace Corps Community Economic Development Volunteer, as Brian was there helping every step of the way. Every day, rain or shine, volunteers and local community members worked to make this family’s dream a reality. All of their efforts helped create a real impact for a family and community in rural Costa Rica. Throughout the whole build, the sharing of ideas, stories, jokes, and food built a bridge between two cultures, and all participants left with a deeper understanding and respect for their fellow humankind. These exchanges highlight the importance of volunteerism and community development on the international level; It all boils down to one thing, world friendship. Bricks to Bread is already planning their next build for spring 2019 in the Talamanca region. The organization is looking forward to continuing strong relationships with Peace Corps Volunteers and changing lives with a brick and a loaf. Daisy, a local community member at Brian's site, practicing her cooking skills with the new brick oven. “If pictures could tell our story, this one says so much of what Bricks to Bread is meant to accomplish: build relationships and change lives. The special relationships that all 14 volunteers gained during the build will last a lifetime. The cultural experiences we encountered has opened our eyes and deepened our love and respect for our own culture and that of our fellow Costa Ricans. The ability to give back to humanity and help another fulfill their dreams is priceless. We are all changed and look forward to our next adventure, our next build.” - Nancy Fitzimons Alvarado. PCVs Brian and RPCV Nancy (Co-founder of Bricks to Bread). PCV Brian is from Franklin, Tennessee. Before joining Peace Corps he studied at the University of Tennessee, Knoxville. Currently, Brian serves as a Community Economic Development volunteer in a rural community in the Zona Norte region of Costa Rica.